Click the Order button on the Top right hand side of the Menu Bar. Click the 'Order' button on the Top right hand side of the Menu Bar to start ordering. 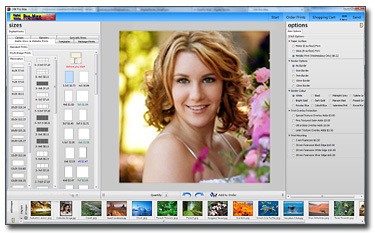 The images will appear in the Folder Panel within the Image Tray. In the "Print Sizes Panel" on the left, 'click' to select the Print Size you would like to order. The "Print Size" selected will appear in the center Product Panel. 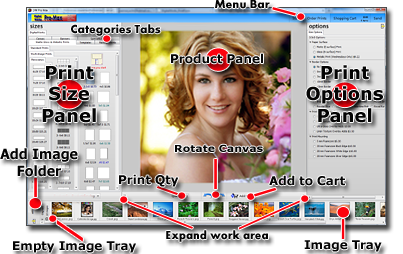 Click & drag an image from the Image Tray to the Product Panel. By clicking on the image within the Product Panel, a tool will appear which allows zoom, pan, and rotate the image. The icon on left of this Tool allows the entire image to fit within the Print Size. Clicking again will revert to the 'Crop to fill' option. The Options Panel on the right allows the choice of paper type, color type, mounting, framing options etc. Enter the quantity you want to order in the Print Quantity box. Then click the 'Add To Cart' button. the image is now prepared for printing and is added to the Order Cart to be uploaded list. Notice a shopping cart above the image indicating the images which have been ordered. 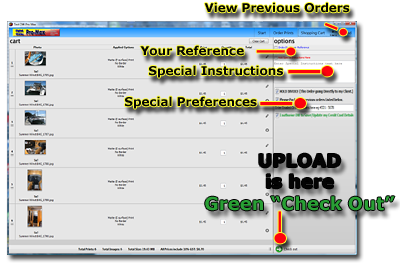 To see what you have ordered Click on the View cart icon. Located on the right corner of the Menu Bar. Thumbnail of each image ordered. Price of the product ordered. Packing previous orders together to save on freight.